The table consists of an octagonal top with plain central section surrounding by a profusely carved floral and foliate design with a gadrooned edge leading down to a carved and shaped frieze. 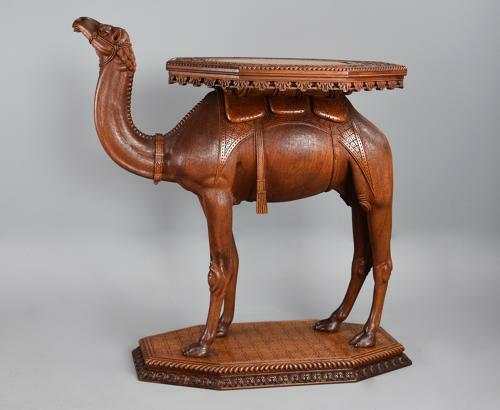 The table top is fixed to the superbly carved camel body consisting of a carved saddle and rug on his back leading down to the camel base with carved geometric design and gadrooned edge. This table is in excellent condition, is of stable construction and can go straight into a home – it is a statement piece and would suit any period of property whether old or new. Please note: we do also have an almost identical camel table in stock if you are looking for a pair, please contact for further details.